In 2012, several events triggered a deep crisis in Mali, paralyzing the country: first the takeover of Northern Mali by separatists and Islamist groups, and second the coup overthrowing President Amadou Toumani Touré in March. At the request of Mali, France launched in January 2013 the military intervention Serval, in order to stop the progress of jihadist forces and help the country regain its territorial integrity. Presidential and legislative elections were held in 2013 with the election of Ibrahim Boubacar Keïta as President. In 2015, an Agreement between non-terrorist rebel groups and the government was signed in Alger, with the support of the United Nations. France welcomed the signature of this agreement by rebel groups of the Coordination. France supports Mali in the implementation of the Peace agreement which remains difficult today. 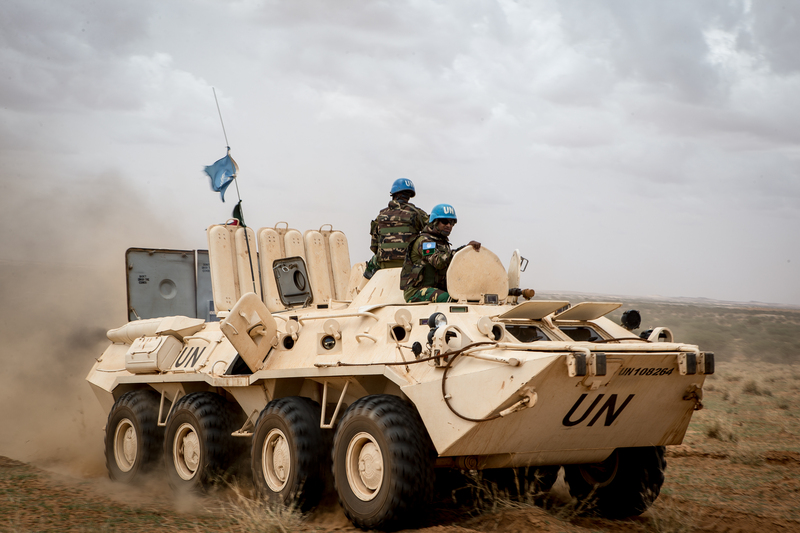 International community remains mobilized through the UN peacekeeping operation MINUSMA, the G5 Sahel Joint Force and the French operation Barkhane. At the United Nations, France played a key role for the adoption of several resolutions, including resolution 2100 (25 April 2013) creating the United Nations Multidimensional Integrated Stabilization Mission in Mali (MINUSMA). This peacekeeping mission aims in particular at monitoring the ceasefire and supporting the implementation of the Peace and Reconciliation Agreement. MINUSMA is the only UN peacekeeping operation operating in a terrorist environment. That is why France supports an increase of personnel and the commitment of new troops contributing countries. At the regional level, G5 Sahel states created a joint force aiming at fighting the terrorist threat, in particular the securing of border areas. The Security Council welcomed its deployment with the adoption of resolution 2359 in June 2017. With resolution 2374, the Security Council also reserved the option of setting up a sanction regime against those who violate the ceasefire, impede the implementation of the Peace Agreement or carry out attacks against the MINUSMA. In Mali, French soldiers fight alongside the African forces and MINUSMA. At the request of the Malian government and under Security Council resolution 2085, France launched the operation Serval on 11 January 2013 in support to African and Malian forces, to repel terrorist groups from Northern Mali. Operation Barkhane replaced operation Serval on 1st August 2014 in order to broaden the support of the French forces to the five Sahel States (Mali, Niger, Burkina Faso, Chad and Mauritania) in the fight against terrorism. It includes among others, 4,000 soldiers, drones, fighter aircrafts and helicopters. The French forces neutralized nearly 150 terrorists in the region in 2016. With the operation Barkhane, France provides operational support to the G5 Sahel Joint Force and MINUSMA when threatened by a serious and imminent danger. Operation Barkhane is the largest French deployment abroad. Since 2014, more than 1,000 operations and patrols were conducted in the Sahel-Saharan strip.